When I attended the launch of the next stage of Fitzgibbon, I was impressed by the temporary structure that is now gracing the site. The structure will house the sales office as well as the community liaison officer. The building (pictured below) demonstrates that portable structures are appropriate for a range of temporary uses in community contexts. 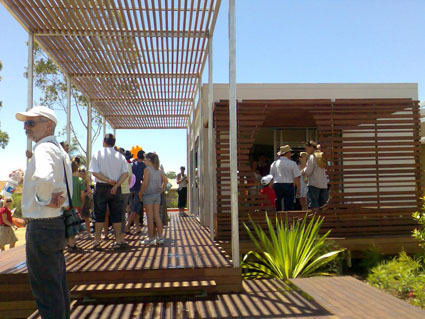 As I said to John (picture below in a white cap), the building is in fact better than our house and appears more suited to our climate – comprised of two pavilions connected by a breeze way and with three sheltered verandahs. Indeed, a far cry from the demountable buildings used at my old high school. It took a team of apprentices (under appropriate guidance) 24 hours to erect. It makes my proposition that Councils could retain a ‘library’ of portable buildings for temporary community uses all the more feasible, so that when temporary propositions arise, e.g. a vacant or underutilised site or location specific activities and events, resources are available to the community to make the most of it. In From an outer suburban life, written for Proboscis’ Transformations Series, I proposed that a local vacant car yard could provide an appropriate site for some kind of temporary community venture such as a youth space.